Purple Asparagus educates children, families and the community about eating that’s good for the body and the planet. Through exploration and discovery, we inspire a lasting love of delicious nutritious foods. …and you can help more kids like Kira learn how much FUN a sour bite can be! Purple Asparagus teaches thousands of children across Chicago how important and exciting it is to eat fruits and vegetables every day. We envision a world where every child, every family and every community enjoys good health and a healthy planet through a diet high in fruits, vegetables and whole grains; and so it is our mission to educate children, families and the community about eating that’s good for the body and the planet. Through exploration and discovery, we inspire a lasting love of delicious nutritious foods. In our award-winning flagship program, Delicious Nutritious Adventures, Purple Asparagus’ Adventure Spears lead our Little Spears on taste adventures through the exciting world of fruits and vegetables. Our programs fight obesity, promote heart health, and decrease the risk for type 2 diabetes by teaching kids the importance of eating fruits and vegetables in a way that is fun and memorable. Our little spears then in turn inspire their families to explore new foods by preparing our delicious and nutritious recipes at home. So, Purple Asparagus isn’t just helping local kids and families today; we are building a future of healthy and adventurous eaters for a lifetime. Ensuring good health and a healthy plant for every member of our community is important to us. Purple Asparagus provides education and inspiration for those in our community with access to delicious and nutritious foods to help them make better choices and explore the exciting world of healthy eating; and we advocate for those in our community without access to delicious and nutritious foods and fight for equity and opportunity for every individual to live a delicious nutritious life. Purple Asparagus is changing the future… one bite at a time. Our Delicious Nutritious Adventures program fights obesity, promotes heart health, and decreases the risk for type 2 diabetes by teaching kids the importance of eating fruits and vegetables in a way that is fun and memorable. Our “little spears” then in turn inspire their families to explore new foods by preparing our delicious and nutritious recipes at home. we are building a future of healthy and adventurous eaters for a lifetime. Through exploration and discovery, Purple Asparagus programs inspire a lasting love of delicious nutritious foods by educate children, families and the community about eating that’s good for the body and the planet in ways that are fun, interactive and memorable. 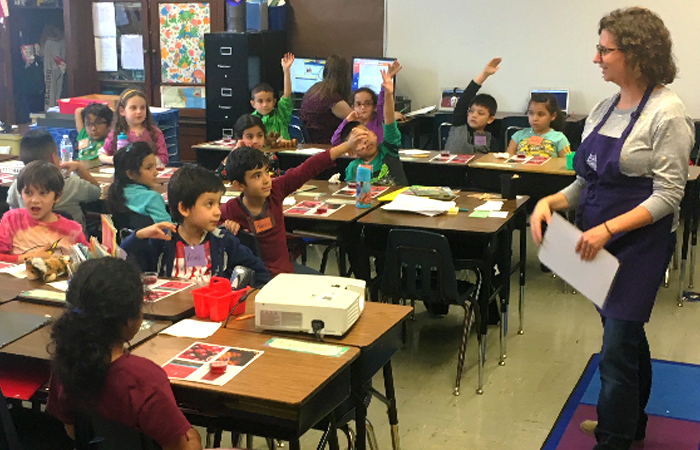 Since 2011, Purple Asparagus’ award-winning flagship program, Delicious Nutritious Adventures, has brought healthy foods to life for tens of thousands of elementary school children in Chicagoland schools. Family Cooking Programs are offered in schools as a supplement to our Delicious Nutritious Adventures, and in the community as a one-time program or a multi-series program, helping to build a bridge between the classroom and the home kitchen. 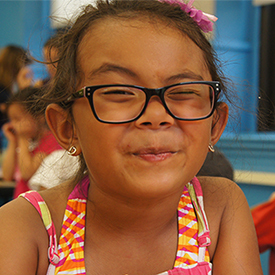 In collaboration with several community-based health and social justice partners, Purple Asparagus seeks to improve the health of all of Chicago’s children. Exploring the world of fruits and vegetables doesn’t end with the school year. Purple Asparagus can partner with your summer program to provide learning and fun customized to your age group and ability. Purple Asparagus’ team of super Spears have years of professional and personal experience helping kids, adults and families learn more about the importance of eating fruits and vegetables every day. “The kids love when Purple Asparagus comes. It’s the biggest highlight of every month. There are lots of ways you can help to educate children, families and the community about eating that’s good for the body and the planet. Every financial gift is important to us. Whether it’s a one-time contribution or a monthly sustaining gift, every dollar will help us reach more kids and their families. Giving your time and talent to help kids and families in Chicago learn about the importance of eating fruits and vegetables every day will have a lasting impact on the future. Do you have an adventurous spirit, a love of eating healthy fruits and vegetables, and a passion for serving our community? Join our team!